As tablets become more popular, more and more business people are taking advantage of their durability and the convenience of carrying tablets instead of laptops to work. Naturally, tablet makers are realizing their worth in a business setting and are creating more and more fantastic applications that can replace many programs that are reserved for desktop or laptop computers. This is especially true for applications that can help professionals deliver high quality presentations on the go. 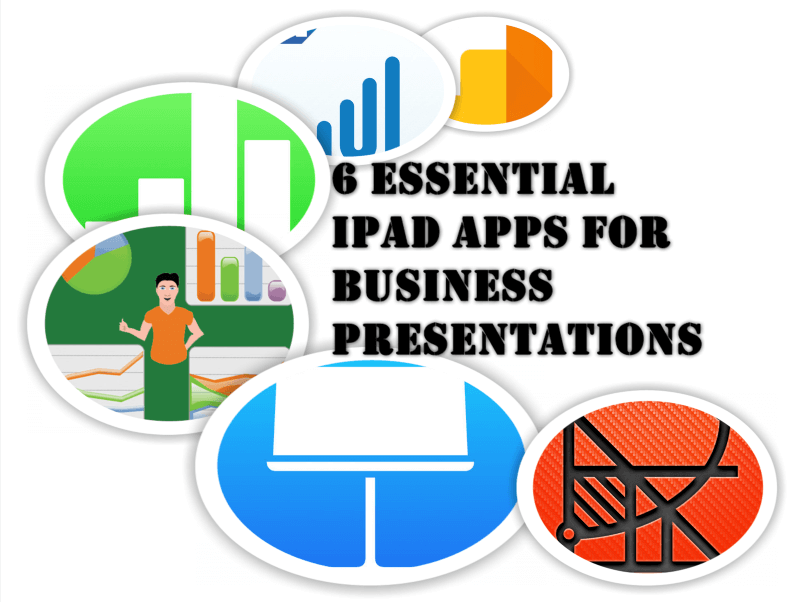 Here are 6 must-have iPad applications for business people who want to be able to create and exhibit highly professional and advanced corporate presentations on their Apple tablets. Even the most adamant Apple users still turn to Microsoft Excel when it comes to creating tabular data, and even if they don’t, they probably work with or collaborate with people who do. Roambi Analytics enables you to transform data from Excel spreadsheets, Google Docs and other sources into professional visualizations of the data you want to present. Easily transform your boring charts and spreadsheets into sleek, eye-catching and interactive visual presentations when delivering reports to your colleagues and clients. If you are someone who prefers making presentations in Microsoft PowerPoint, then this is a good application to have. Simply export your presentations from PowerPoint as PDFs and then import them into this app. One of the best things about Power Present is how easy it is to get your presentation onto a projector. The app detects the signal as soon as a VGA cable is connected to your mobile device and immediately sends the presentation to your projector. It also enables you to draw on the presentation in real time while displaying it, highlight important text and even write on a built-in whiteboard that gives you additional options for interactive and stimulating presentations. If you need to present website information to your coworkers or bosses, Google Analytics is the industry standard. Thanks to Analytics HD, you have the power of Google Analytics in the form of a convenient app that is not only more powerful and diverse for presenting website data, but it’s also a lot more convenient than sharing Google Analytics through your browser. If you are following the progress of several websites, the app allows for quick switches between numerous accounts, gives you the possibility of showing full-screen charts and provides a very intuitive and user-friendly interface that even Google Analytics novices can understand and master quickly. Spreadsheets are still a very-much preferred way of showcasing business data and statistics, but Numbers takes them to a higher level with the possibility to add tables, charts and graphics to your spreadsheets in order to spice them up. If you want an application that allows you to directly input your data into spreadsheets instead of importing them from other sources, Numbers is the one to go with. But of course, if you want to import already-created spreadsheets from Excel or some other program, you can do that as well. It also works with iCloud, which enables you to have your spreadsheets available no matter where you are and what device you are using. This iPad application makes creating precise and impressive graphs a snap. These are not simple pie graphs; OmniGraphSketcher gives you endless capabilities for customizing your graphs, allowing you to get even the most detailed statistical points across via graphs. You can even important statistics from an application like Numbers and get precise graphs made from the data in seconds. It’s also incredibly easy to use and even allows you to freehand draw to create additional lines, data points or shaded areas with ease. Most business professional swear by Keynote and feel that it is the best and most powerful presentation app on the market. With Keynote you can create animated presentations while adding things like pie charts, 3D bars, line graphs and charts all within this one application. Of course, Keynote enables you to import PowerPoint files from your iCloud and then spruce them up and make them even more powerful with the use of all the added features that Keynote contains and PowerPoint does not. Analytics HD is the best ever app for business owners having connected with Google Analytics.